When you’re looking to buy an ERP system, there’s a lot you have to consider. You need to know what you want the software to accomplish and what improvements you want to make in your shop. You need to decide which software company to pick. 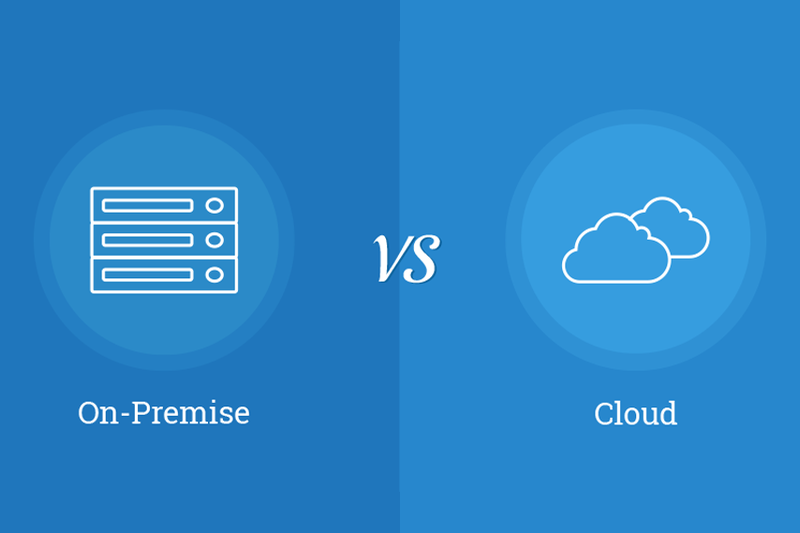 You also need to decide whether you want your software to be hosted on the cloud or hosted on-premise. Not sure about the differences? We’ll compare the two here. An on-premise ERP system is hosted on a server in the shop. In order to host the software, shops are required to have an up-to-date server, server licensing, and a reputable anti-virus program. Shops cautious about the security of their data may choose the on-premise route. Most often, these are shops that primarily contract with the government and have to meet extensive compliance measures. Most shops do not fall into this level of scrutiny about their data security needs. Shops that choose the on-premise route prioritize security over remote accessibility. One drawback of hosting your data internally means that you are responsible for the constant backups of your data. If something goes wrong and you lose everything, you’ll only be able to bring the system back from the last time it was backed up. On-premise is a great option if your internet connectivity is weak, since it only needs to communicate within the shop’s computer network. However, this means that the computer infrastructure within the shop has to be reliable. If one computer is vulnerable, it could potentially disrupt access to the shop’s ERP software. So, while on-premise might be the right move for shops that need to keep all of their data within their shop’s walls, it can be limiting to those who don’t need that level of data isolation. A cloud-based ERP system is hosted remotely. What this means is that a company who specializes in hosting data and software makes sure all servers are up to date, the connections are solid, and that their anti-virus software is secure. Because of economies of scale, it is much more cost effective for hosting companies them to buy top of the line servers, anti-virus software, multiple back up locations, and everything else than it would be for one shop to buy all of that. This way is actually more secure than an on-premise ERP software because a hosting company will have constant monitoring and backup security measures in case something goes wrong. Another benefit of choosing a cloud-based ERP system is that shops aren’t burdened with ongoing IT costs. Because the software is hosted remotely, shops can access it from anywhere they can open a webpage, including mobile phones or tablets. Cloud-based systems will not burden a shop’s internet connection. They also provide peace of mind in the form of automatic backups. If something happens to your data, your vendor can restore everything from just before that happened. Eliminate the fear of losing data! With the best ERP vendors, they offer maintenance plans based on the price of the system. That means that if a shop runs into problems with their software, they won’t have to pay extra to get the problems fixed, and technicians can log in remotely to fix any problems quickly. With its versatility, high security, and light IT burden, cloud-based systems are the better solution for most shops. Still have questions about which option is better for your shop? Click below to schedule a personal demo with an E2 expert to see which is a better fit for your business.